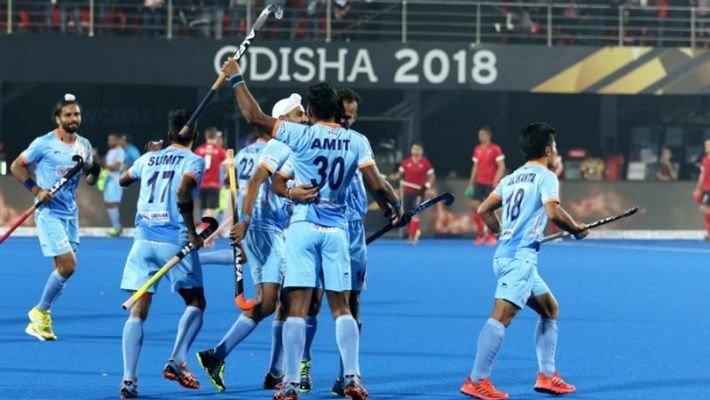 Bhubaneswar: An impressive India thrashed Canada 5-1 to top Pool C and seal a direct berth in the quarter-finals of the men's hockey World Cup in front of a capacity crowd at the Kalinga Stadium here on Saturday. By virtue of this win, India finished on top of Pool C with seven points ahead of world number three Belgium on account of better goal difference. Belgium, too, on seven points, finished second ahead of third-placed Canada after thrashing South Africa 5-1 in the other Pool C game earlier in the day. South Africa crashed out of the tournament. Canada, too, overcame South Africa by virtue of a better goal difference. Both the teams finished their pool engagements with one point apiece. India will play their quarter-final match on December 13.